Unrailed! 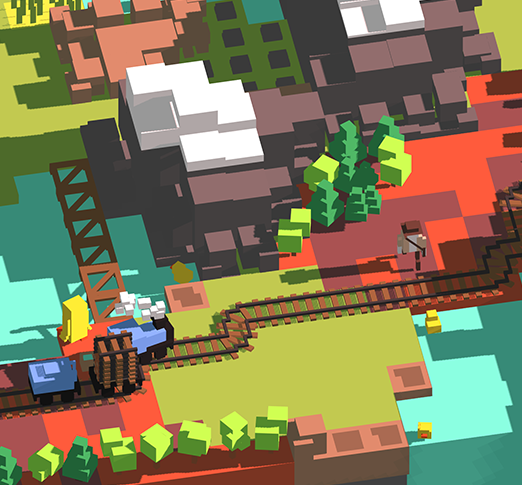 is a cooperative multiplayer game where you have to work together with your friends to build a railway track across endless procedurally generated worlds. 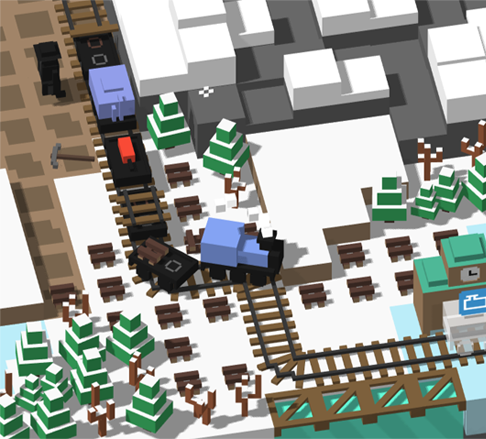 Master random encounters with its inhabitants, upgrade your train and keep it from derailing! The game will first be available as Early Access title on Steam. After successfully passing the tutorial, the first thing you’ll do is to gather some wood and iron to craft your first tracks. You will have to decide who among your peers gets to do which job so that your team functions like a clockwork producing and laying out tracks in a line. Of course that is until you are trapped in a flock of unbudging cows, you reach a choke point in the terrain that cuts you off from your crafting wagon or your train starts burning in flames because someone forgot to water it. If however you manage to survive, after some time you will see the landscape change, from the grass green Switzerland over snowy mountains populated by scary yetis and sleepy walruses through a far reaching desert where bandits lurk around every cactus and lush oases with camels tanning in the sun to an ecosystem interweaved by hot lava streams and haunted by otherworldly creatures. On your journey you will have numerous encounters with the inhabitants of the world. Unrailed! features a local and online multiplayer mode. Find fellow railroad engineers online or build a railway faster than other teams online! The game in its entirety, from used fonts over UI and character and environment models to particle effects is designed with a coherently blocky, voxel style inspired look. Even the animation is realised by the stop motion technique. All models are designed to be easily recognizable in the heat of the action. Through the artstyle, we want to give an impression of a small toy world, with which the player interacts through a view from above. Unrailed! will first be available as Early Access title in summer 2019 on Steam. The co-op train game Unrailed! (former name Derailed!) is currently in development for PC and Consoles by a small Indie Game Studio Indoor Astronaut from Switzerland. Visit our blog for more details and development insights. Check out our official Facebook page. Follow us or get in touch with us on Twitter.